Now that summer is over, I’ve begun to think about ways I can transition my bright pieces into the cooler season and make them more autumn-appropriate. This gorgeous silk blouse just arrived from Sheinside and, though I wore it over the weekend with white jeans & a fedora, I also love the idea of mixing it with a richer hue for the months ahead. Other summer/fall color combinations I’ll be trying next: peach + burgundy, chartreuse + forest green, hot pink + navy. LOVE that skirt!!! and REALLY love that cuff!!! can't believe it's target! have the BEST time ever in NYC! Love the skirt! I have my eye out for the leather skinnies in that color. i love that you are trying out diff color combos!! can't wait to see how they turn out! 🙂 love your skirt! This is a wonderful look! <3 love the cognac color skirt! Absolutely loving green right now! This skirt is amazing, such a sophisticated look. Love this outfit and that you are already wearing your new pieces! I need to stop by my local Target – the cuff is so gorgeous!! Gorgeous outfit. Love your wedges. love the green top-leather skirt combo. Gorgeous!! i love the nail polish! what color is that? Loving your camel leather skirt! Looks fabulous with the teal! Have a great time at NYFW! I will be making the flight back next year! I love this entire outfit! Especially how you styled your new wedges! Your hair looks great! LOVE this look! the bluse looks amazing with leather skirt and the shoes are to die for! and your hair is especially gorgeous in these photos! Love how you incorporated colour into your fall look. Love the green on you! The blouse is such a gorgeous color. I love it with that color skirt. I wish I had had a better experience with Sheinside….I ordered a blouse from them after seeing your last post and they informed me after 2 1/2 weeks that the blouse was sold out. So disappointing! I'm not sure I would order from them again. Love that top and skirt combo, especially with the colors! Loving the skirt and shoes!!! This outfit is beautiful! The colors are so lovely. That top is amazing! I too am looking at all the brights in my closet & trying to figure out what richer tones to pair them with to bring them into fall. I love this combo! I think a leather skirt is a must this season! Have fun in NYC! Love this outfit! Your shoes are adorable! We love reading your blog! Love this look! That skirt is perfect on you! I have those same shoes, I'm going to have to try and recreate this look! Love the combination of those two pieces: the colors and textures are perfect together and I would never have tried it! And the cuff is brilliant!!! I have been trying to figure out a way to incorporate my bright pieces into my fall wardrobe as well! Thanks for the fun idea! I think green may be your color! Awesome outfit! Its great that you will be incorporating your bright pieces into fall. There is no reason why autumn has to be only about somber colors. LOVE this look! Agreed that bright colors definitely do have a place in Fall fashion. I might have to pick up a skirt like that one to add to my wardrobe! Love your style! This outfit is perfect for transitioning into Fall! xoxo. I love love love that lip color! Now I'm tempted to get the same one for myself! Emerald is your color lady! That skirt is amazing – I wish I'd bought it over the holiday weekend! Maybe I'll take advantage of their buy a jacket, get a skirt free promo! Enjoy your trip! 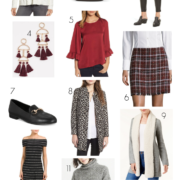 I love this look, it's perfect for fall! That shade of green is stunning on you! Love that skirt!!!!! Perfect for fall and looks great paired with a bright color! I love how you paired a breezier blouse with the leather skirt! And the colors are gorgeous. FLAWLESS transition. Your style is impeccable. Your blog is an inspiration. This ensemble is no exception. BTW… I have added your blog to my "blog roll". Hope anyone who stops by my blog will "transition" over to yours, too. LOVE your style. LOVE your blog. This whole ensemble is perfect. The colors are made for each other. Your "transition" is working wonderfully. LOVE that skirt, too! What a wonderful color! BTW… I have added your blog to the "blog roll" over on my blog. 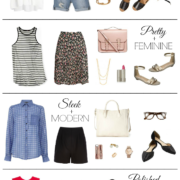 I hope that all of my readers will "transition" over for some inspiration from your amazing style. Love the green top with the brown leather. And that cuff is amazing! Such a great look! Loving that blouse and skirt! i love this look! that skirt really looks killer on you! love that leather skirt! absolutely gorgeous lady! So chic. I love the skirt. I am so in love with this outfit! That colour combination is gorgeous, and that skirt is so perfect for Fall! LOVE it! You're just beautiful!! I can't wait to do the same with brights and deep tones! Excited to see all of your looks! love this combo! That skirt is really adorable! Gorgeous skirt! I love that color of top with it! I think that mint and tan are a lovely combination. I wondered how much the minty green / aqua pieces from the summer months would transition into the cooler temperatures – I look forward to seeing more of this series! I have always loved how leopard print and green pair together; it's such a classic and chic look! Here I also love how you've paired those two elements w/ that fantastic faux leather skirt! Looking good! love your look! 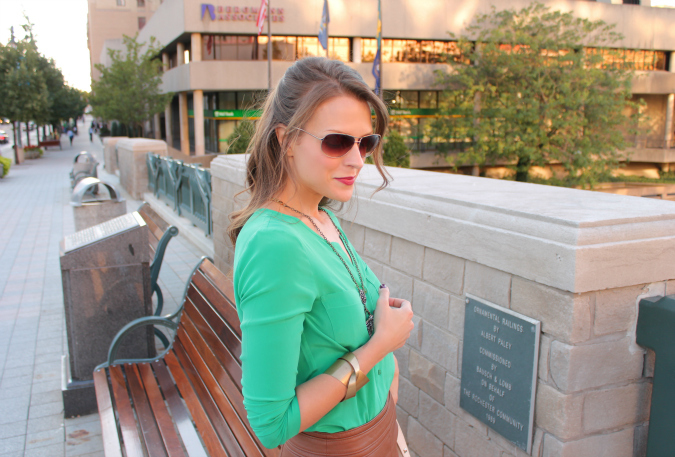 the leather skirt is great and the color combo is perfect for fall! I was going to tell you I love the skirt…but I really love the entire outfit! Love Love! I've never loved the idea of leather skirts more than I do know!